Designed for all vertical files (Steelcase, Hon, Global and others). For all standard file drawers. 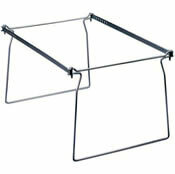 Made for all brands of hanging folders. Adjustable length from 18" to 27" long. Meets all federal specifications. For 9-1/4" drawers. Adjustable notched side rails. Adjusts from 24"- 27" deep. Ships flat, easy to assemble.